People like Luis Rivera are being locked out of the formal workforce forever thanks to one youthful mistake. Luis Rivera had some peace of mind for about five months, from late fall of 2010 through early spring of the following year. That’s the closest thing he’s seen to financial stability in more than twenty years. “I got hired for a wonderful job. It was a clerk/porter/doorman position at a high-rise classical building in the East Village,” he recalls wistfully. Rivera, 44, has a wife of twenty-five years and three teenage daughters. They live up in East Harlem, where the Puerto Rican–born New Yorker grew up and has spent much of his life. He’s ferociously proud of his marriage and children; his back straightens and his tone turns serious when he talks about his family, like a man who’s managed to achieve something he’s been told he can’t accomplish. Yet looking back on those five months as a jack-of-all-services for wealthy downtown hipsters, Rivera still gets excited about an opportunity that tore him away from home at all hours. The new position held promise that Rivera could finally work just one legit job—on the books, with steady hours and a steady paycheck—rather than hustling to piece together part-time informal work, as he’s done his entire adult life. But that promise hadn’t yet been realized. He was still at the mercy of his employer’s whims. If they called, he worked; if not, he didn’t. So when the superintendent of a building across the street mentioned that his crew was looking for part-time help as well, Rivera put in his name. While applying, he was honest to a fault. “I made the mistake of trusting,” Rivera says now, shrugging. “I explained to this guy that I have a record from 1990-something. But I explained that I paid the price. I’m clean—gimme a chance. He gave me his word of honor that he would not tell.” But word travels fast when you’re an ex-con. Suddenly, the upscale building at which Rivera hoped to build a future stopped giving him shifts at all. Rivera is part of an uncounted population of formerly convicted or incarcerated people trying to find work in a hostile economy. They are failing, by and large, thanks to the illegal but still widespread practice of employers rejecting applicants or firing workers solely because they have criminal records. A growing movement is pushing states to “ban the box,” or more closely regulate when and how employers can ask about criminal records on job applications. The movement has logged some victories: in October, Target, the nation’s second-largest retailer, announced that it would stop asking the question of prospective employees. The move comes after Target’s home state of Minnesota passed “ban the box” legislation—one of ten states to do so, according to the National Employment Law Project (NELP). But the way that many companies screen for criminal records is already barred by federal law. Back in 1987, the Equal Employment Opportunity Commission declared that blanket bans on hiring people with criminal records were a Civil Rights Act violation. 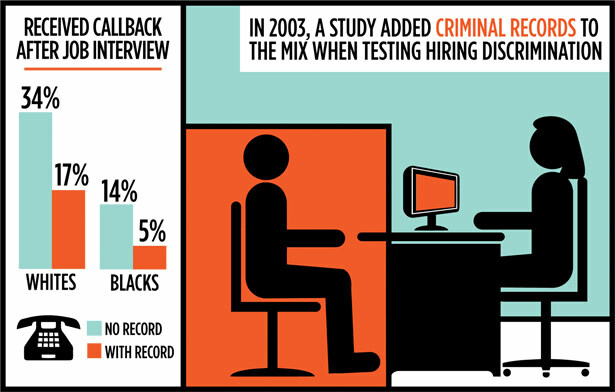 The EEOC noted that the law bars not only overt bias based on protected categories like race, but also seemingly neutral policies that have the effect of reinforcing racial disparities So it told employers that they can consider criminal records only as one factor in hiring, and then only when the conviction is directly related to the work. But Congress is most responsible for undermining this guidance. Following 9/11, lawmakers issued blanket bans on former felons working in a broad range of transportation jobs. States followed suit, and the list of banned occupations grew exponentially: private security guards, nursing home aides, just about any job involving kids. Former felons are now categorically barred from working in more than 800 occupations because of laws and licensing rules, one study estimates. Partly in reaction to this growing list, and partly in response to the simultaneous explosion of the background check industry, the EEOC issued an updated guidance in 2012. The new guidance didn’t change the core idea—that blanket hiring bans based on criminal records have a disproportionate impact on black and Latino workers and thus violate the Civil Rights Act; instead, it offered employers updated details on how to stay on the right side of the law. In sum: if you conduct background checks, your hiring systems must include a granular method of confirming their accuracy and considering the specifics of a person’s case. The experience Rivera describes is just the sort that would not pass muster. If so, the EEOC has got its work cut out for it. 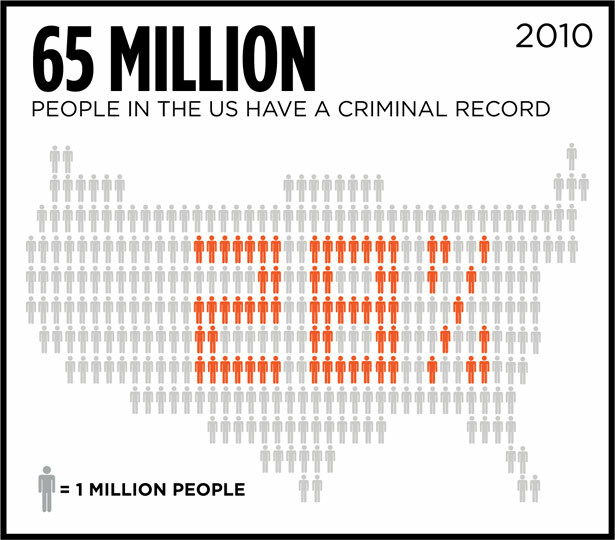 There’s no firm number on the population of workers with criminal records, but the NELP estimates that there were 65 million in 2010—a stunning 28 percent of the adult population. In 2006, the Justice Department spitballed the number at 30 percent of working-age adults. A great many of these people have faced background checks. In explaining its updated guidance last year, the EEOC cited a 2010 study showing that 92 percent of large employers run background checks. The millions of people who likely get locked out of the job market as a result of their records aren’t just sitting around. They’re churning through formal and informal part-time work, fueling a shadow economy akin to the one that often exploits undocumented workers. In this case, the problem isn’t the papers that workers lack, but those they can’t shed. The impact is similar nonetheless: billions of dollars in lost productivity, forfeited tax revenue for cities, rampant exploitation by employers, and a cascading series of bans and exclusions from civic life that make it almost impossible for these workers to achieve a stable economic existence. And all of these problems are concentrated in already struggling black and Latino neighborhoods. 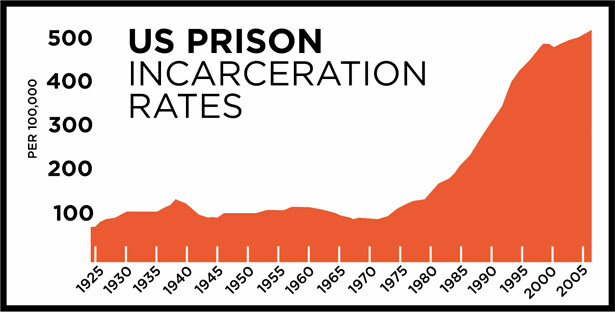 Much has been said about the dramatic rise in the US incarceration rate over the past three decades. But it’s difficult to overstate either its scope or the intensity of its racial disparity. After decades of maintaining a largely steady level, in 1973, in the wake of the civil rights movement’s tumult, the incarceration rate began rising sharply. 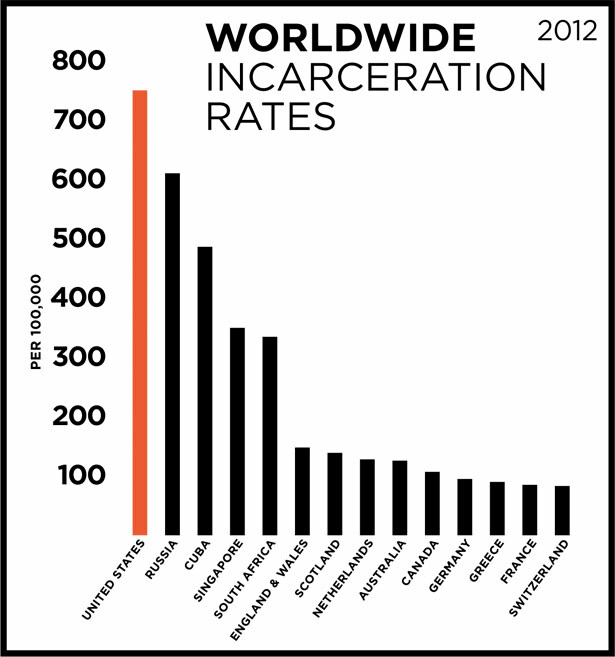 By 2000, 3 percent of the US population was either locked up, on probation or on parole—a rate unparalleled worldwide. 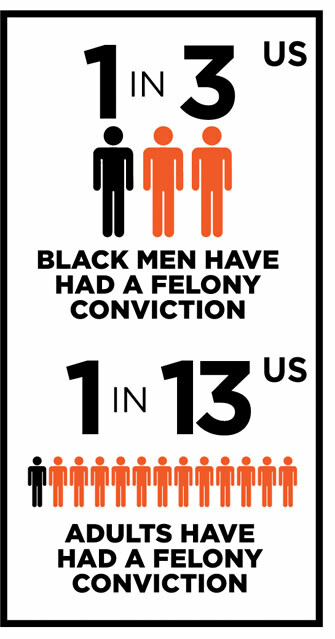 As Michelle Alexander, author of The New Jim Crow, has demonstrated, this trend disproportionately affects people of color—the Justice Department has estimated that a third of black men and nearly a fifth of Latino men born in 2001 will go to prison in their lifetime—and now underpins the stark racial inequity found throughout US society. Marijuana has become the engine driving that inequity. This past summer, the ACLU reported that black Americans are four times as likely as whites to be arrested for marijuana possession, despite reams of research showing no racial disparity in marijuana use. In New York City, this year’s Democratic mayoral primary was dominated by outrage over the New York Police Department’s practice of “stop-and-frisk,” a program by which the NYPD has indiscriminately detained and searched huge numbers of black and Latino men under the guise of hunting for illegal guns. The NYPD’s arrest records suggest that the primary outcome has been to generate marijuana possession busts; in 2012, according to a New York Civil Liberties Union analysis, the program produced a six-to-one ratio of weed arrests to guns recovered. Martinez is baby-faced, with short braids and wisps of fuzz on his dark chin, but he’s a hulking presence at over six-foot-three and with a linebacker’s build. He considers this heft a liability on the street; it made him a target for people with something to prove. So he started carrying a gun. “It was just a precaution,” he says now, “being prepared for the worst—and a pessimist, kinda.” In December 2010, the cops stopped and arrested him after finding it on his person. Martinez fought the case just long enough to graduate from high school, then accepted the prosecutor’s deal of two years in prison followed by a year and a half on parole. He came home this past April, hoping to go straight to work. First he had to find a place to live, a challenge immediately complicated by his conviction. 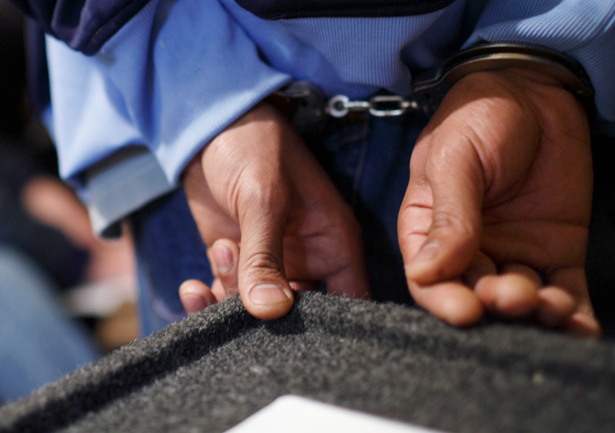 The knock-on effects of a criminal record are far broader than just job bans. A drug conviction will keep you from getting federal student loans, grants or work study. Several states also bar people with drug-related felonies from food stamps and welfare. And cities have passed a proliferating number of ordinances banning people convicted of certain crimes from a range of public spaces, including parks. But among the more striking bans is in public housing. So Martinez couldn’t go home—not that he wanted to anyway. His girlfriend had given birth while he was locked up. Their daughter was born premature, weighing just one pound, two ounces, and she required oxygen and a tracheotomy tube to live. They had survived by piling into Martinez’s mom’s apartment with his sisters. But Martinez was dead set on his disabled daughter not sleeping on the same couch that he’d surfed his whole life, even if the city had allowed it. It took some doing, but they convinced the city that they were homeless in order to be placed together in a shelter apartment. But advocates minding the larger landscape say that if Martinez’s record does fade into the past, his will be an exceptional story. Luis Rivera’s is more typical. The longest job Rivera has held was for three years at a Dunkin’ Donuts franchise. The owner didn’t care about his record because, Rivera says, the place was packed with security cameras. But the opportunity may have also come because Rivera accepted that he had little choice but to work long, hard hours for minimum wage. He worked fourteen-hour shifts routinely and once even worked twenty-four hours straight, he says. Every other gig he’s worked has lasted a few months here, maybe a year there, typically part time and often off the books. Rivera has made deliveries for a Broadway ticket broker. He’s answered phones for a production company. He’s filled in at Bloomingdale’s and managed inventory for a local company that manufactured boxer shorts. “Whatever… you name it. I worked for the city! I volunteered to clean snow at the time of the blizzard we had a couple years ago,” he brags. “Right now, I’m blessed that I have two jobs.” He cleans office buildings at night, off the books, and has a temporary kitchen job at a Turkish restaurant for $10 an hour—though he hasn’t told them yet about his record. And they are likely widespread. There’s no telling how many people are in the shadow economy created by criminal records, but a Center for Economic Policy and Research study looked at just the data for 2008 and calculated that the population of people with felony convictions lowered the official employment rate among all men by as much as 1.7 percentage points. More so if you look at the job numbers by race. The official jobless rate among black Americans remains above 13 percent—roughly double that of white workers, and on a par with the national rate during the Depression—while hovering just below 10 percent for Latinos. But the numbers grow particularly stark when you drill down on places like New York City, where the aggressive policing practices of the past two mayoral administrations have swelled the ranks of those who have been in some form of state supervision. There are no good data on how many of those people don’t find work on release. 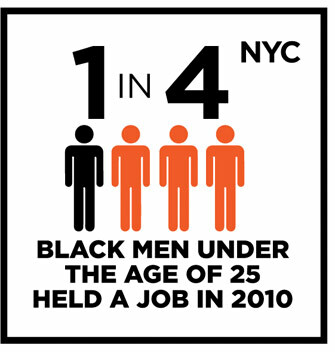 But a 2010 study by the Community Service Society of New York, which charted the recession’s impact on joblessness, found that a shocking 18 percent of black men in the city were unemployed by 2009, doubling the 2006 rate and standing well above all other groups. And that’s just the official unemployed, a figure that excludes those who have given up looking for on-the-books work. Among Albert Martinez’s peers, the figures are numbing: the same study found that only one in four black men under the age of 25 held a job in 2010. A federal study last year found that more than half of all black New Yorkers are not in the formal workforce at all. “For me, the connections are in thinking about the criminal justice system as an increasingly important mechanism for generating racial inequality in the labor market,” says sociologist Devah Pager, whose 2003 study was the first to add criminal records to the mix when testing hiring discrimination. Previous research had established that black applicants with the same qualifications as white applicants receive far fewer callbacks from potential employers. Pager had pairs of black and white test applicants respond to job ads in New York City and Milwaukee with matching résumés and presentations, while alternately assigning one of them a criminal record. The shrinking space for ex-offenders in the labor market has coincided with a rapid growth in the criminal background check industry. In the decade between 1996 and 2006, according to the NELP’s Emsellem, background checks conducted both by private agencies and through requests to the FBI exploded. Civil requests for FBI checks doubled, such that by 2006 the agency conducted more fingerprint reviews for civil purposes than for criminal ones. The problems with these checks are manifold, including the fact that they’re often wildly inaccurate. In the EEOC’s 2012 guidance, the commissioners emphasize the haphazard nature of many of the databases now determining workers’ fates. They point to studies showing state and local databases with incomplete information that stops at the point of arrest, ignoring whether there was ever a conviction. In 2006, only half the records in the FBI’s database were complete. They’re also rife with clerical errors, like misspelled names. And the databases amassed by private companies often haven’t been updated, including to correct erroneous information. One of the plaintiffs in the EEOC’s suit against Dollar General was fired for a conviction that never existed. All of this is why the EEOC has for twenty-five years been issuing guidances demanding that employers use careful scrutiny when considering criminal records. But Emsellem’s 2010 study found widespread disregard for that guidance. He and his team reviewed thousands of Craigslist ads for low-wage jobs in five major cities. They found more than 2,500 ads with requirements that appeared to violate the EEOC’s policy, and at least 300 that did so overtly, including ones from large national employers like Domino’s Pizza, Omni Hotels and several staffing firms. Meanwhile, the gap between employers’ perceptions and the risk in hiring ex-offenders is as striking as the rate at which these background checks are growing. Within a couple of years after committing a burglary at age 22, Rivera’s statistical likelihood of committing another crime began plummeting. By his late 20s, he was no more likely to commit burglary than someone who had no record at all. This type of bias has had massive consequences in an era of record poverty. The United States lost between $57 billion and $65 billion in GDP in 2008, according to the Center for Economic Policy and Research, as a result of the reduction in male workers. Of course, that lost productivity is concentrated in black and Latino neighborhoods where it is most desperately needed. A 2010 Pew Charitable Trusts study found that having been incarcerated knocks 11 percent off average hourly wages and 40 percent off annual earnings. So Rivera considers himself lucky that he’s got work at all. “I try to think as positive as I can,” he says, counting as blessings his faith, his family, and the fact that he can get food stamps and public assistance in New York City. “I’m not telling you I don’t feel stress. Right now, I’m sitting here, I’m kinda stressed out.” That’s because he’s waiting to hear back from the Turkish restaurant about getting more money and more hours. The restaurant’s managers are talking about bringing him on salary, at $575 a week. The friend who got him the temp job there knows about his record, but not the higher-ups. “I’m not stupid. They’re gonna check me. They always check everybody’s record,” Rivera says, adding hopefully: “But they know that I work. They know how I work.” But if that proud new record doesn’t trump his past, it’s on to the next gig. In “Locking Down an American Workforce” (April 19, 2012) Steve Fraser and Joshua Freeman examined prison labor as the past—and future—of American “free-market” capitalism (originally on TomDispatch.com).